At the end of the Pleistocene a Younger Dryas black mat was deposited on top of the Pleistocene sediments in many parts of North America. A study of the magnetic fraction (~10,900±50 B.P.) from the basal section of the black mat at Murray Springs, AZ revealed the presence of amorphous iron oxide framboids in a glassy iron-silica matrix. These framboids are very similar in appearance and chemistry to those reported from several types of carbonaceous chondrites. The glass contains iron, silicon,oxygen, vanadium and minor titanium,while the framboidal particles contain calcium as well. The major element chemistry of both the spherules and the glass matrix are consistent with the chemistry of material associated with meteorite impact sites and meteorites. Electron microscopy conﬁrms that the glassy material is indeed amorphous, and also shows that what appear to be individual oxide particles are amorphous as well. The latter appears consistent with their overall morphology that, while euhedral, typically shows signiﬁcant fracture. Based on these data, we argue that these particles are the product of a hypervelocity impact. An appreciative Tip of The Hat to Tommy Elifritz for letting the Tusk know this journal article I had heard was coming was actually published this week. Framboidal iron oxide: Chondrite-like material from the black mat, Murray Springs, Arizona is yet more confirmation of weird, weird stuff in the Younger Dryas Boundary — right on the heels of the fascinating Field Report and conference abstract from Andronikov, et. al. 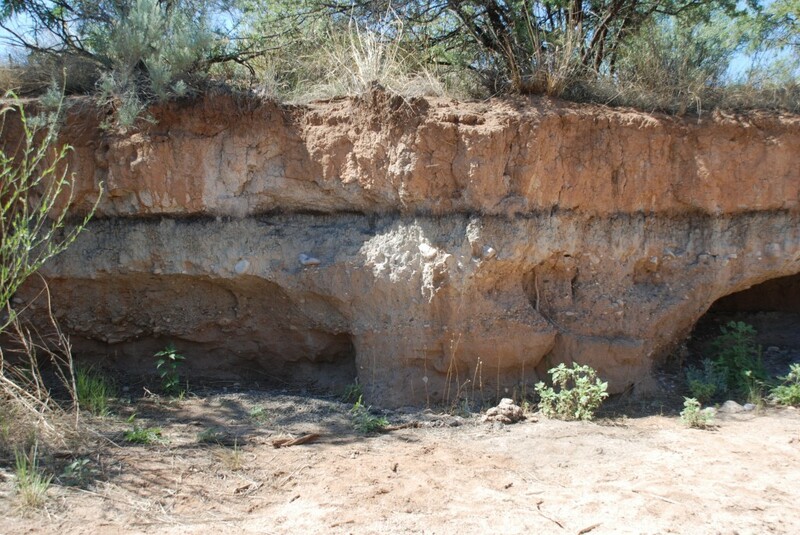 Mostafa Fayek and Sharon Hull of the University of Manitoba, and two fellows named Larry, Anovitz and Allard, from Oak Ridge National Laboratory, have found what they identify as seemingly carbonaceously chondritic material within America’s best studied and well dated Clovis archeological layer, at Murray Springs, Arizona. I will share some personal observations regarding the paper in a moment, but let us first give thanks to this team. Like Andronikov et. al., Fayek, et. al., have continued to directly research the extraterrestrial qualities of the Younger Dryas Boundary despite the spin and misinformation from the critics. Among other insults to science, precisely one year before the publication above, Nick Pinter and others had the nerve to publish a self-styled “Requiem” for the Younger Dryas Impact Hypothesis. Thank goodness these tomato throwers did not deter Fayek, nor has it stopped Andronikov, or Mahaney. In fact, the evidence that a cosmic extinction level event occurred 13,000 years in the past keeps piling up. As to the paper itself, however, I am left wondering; what is the relative abundance of the “framboidal chrondrites” across the stratigraphy at Murray Springs? Are they limited only to the lowest portion of the Younger Dryas Boundary — or is this stuff found above and below the extinction boundary? And in what relative concentrations? One would think this type data would be provided, but one is left to beg for it. And what else did they find down there? I should add that Fayek has been working on this material for at least four years. Here is a video I took of him reporting preliminary findings at the Pecos Archeological in 2008. I note that at that conference Fayek spoke in terms of finding “tektites,” but the published paper uses the term only twice, and the material is not called a tektite. I certainly hope this is not the last word from the Fayek team. This paper leaves the Tusk begging for more. The question now is not whether independent research will continue to confirm that some kind of hell touched earth 13,000 years ago, but rather, when will the confirmations get some notice? The silence of the science press is deafening. I doubt we can expect to see anything out of Richard Kerr, but I have some hope for science blogs — like Chris Rowan @ Highly Allochthonous, Afarensis, Eric Steig @ Real Climate, or others that have covered our subject in the past.